What a couple of weeks we’ve had around here! It all started with celebrating 24 years of marriage a couple of weeks ago. I am so thankful for my sweet man! I am blessed to have met him when I was 13 and married when I was barely 20. He is a wonderful man, husband, father, provider and friend. 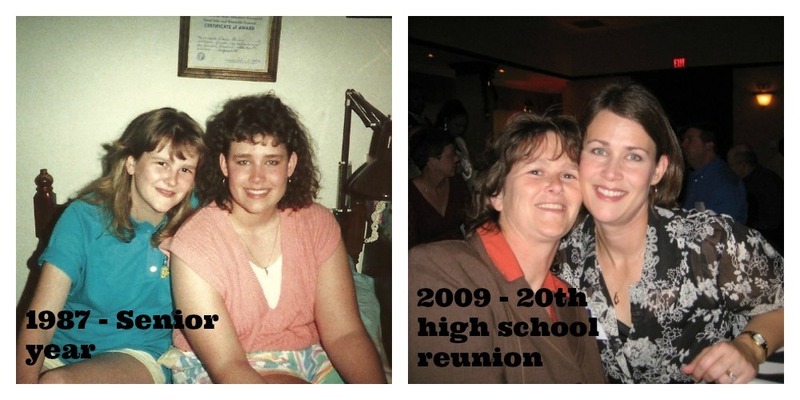 I am also thankful for my bestest friend since high school, Kristi. She celebrated her birthday the day after our anniversary. She is someone who I don’t get to see often enough, but she is the hardest working, most generous, loyal, trustworthy and awesome person. She has been through a lot the last year and she never fails to give anything less than 100% to her family, her job, her church, regardless of what else is going on in her life. She is amazing and I am blessed to know her. Then, there was Halloween. My kids have always enjoyed dressing up. Each year they plan their costumes way ahead of time. Last year was the first year they did not trick or treat. It was a little sad, but they both still wanted to dress up, but they stayed home to pass out candy. This year, Halloween started out fun. 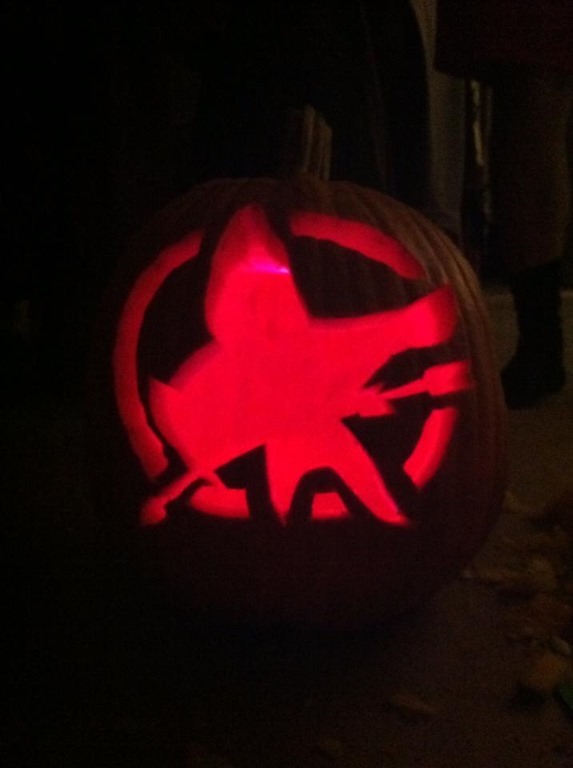 Clyn cleaned out the pumpkin, Emma sketched a Mockingjay on our pumpkin (Y’all do know about Hunger Games, right?? ), and Jacob carved it. My contribution was the photo you see here! HA. It looked pretty cool and some people knew what it was. The true HG aficionados, anyway. 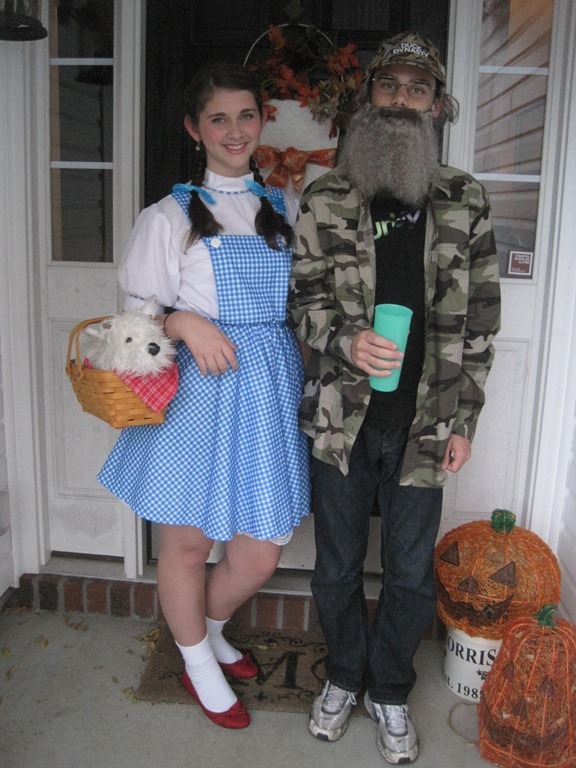 Jacob was dressed as Uncle Si, of Duck Dynasty fame and Emma was dressed as Dorothy. They both looked so awesome! We handed out candy for a bit and then Emma went over to her friend Harper’s house to pass out candy. We had lots of trick or treaters and ran out of candy a little before 8, so, along with Uncle Si, The Hubs and I headed back inside and turned off the porch light. It was Emma who was bitten instead of one of the little kids who was trick or treating. Venom doesn’t have to travel as far in a little one. Emma received treatment quickly, thanks to Harper’s family getting her to the ER so fast, and ER staff who understood the seriousness of treating snake bites in a timely manner. We were able to get to the hospital quickly to be with Emma…it is no accident that all those lights were green! The hospital had the anti-venom in their pharmacy. Emma did not have an allergic reaction to the anti-venom. And it did its job and halted the progression of the venom. God sent people to treat and care for Emma in both hospitals who knew what to do and how to treat snake bites and who were wonderful with kids. No surgical intervention was needed, as it sometimes is with snake bites. My brave and amazing Emma, who kept her sense of humor and was so strong. She really is something special. The massive outpouring of love and encouragement to us and the prayers of so many—it was just amazing. And meant so much to all of us. The miraculous peace I felt throughout the whole thing. Emma is getting better every day. It is during times of crisis that you truly appreciate what you have and who you have. I could see the grace of God in the face of each doctor, each nurse. I could feel the prayers and love of so many. As I looked around the pediatric intensive care unit and saw the lives of children literally hanging in the balance, I was overwhelmed with gratitude, knowing that my daughter would leave that hospital and she would return to life as usual, enjoying all the things she did before. I knew there were some families who would not have that. I met one such mama in the family waiting room as we both were getting some coffee. We can’t understand why things happen as they do, we can only embrace those who are suffering, give them a word of encouragement, and whisper a prayer for them. And never forget to be grateful. Ten Things of Thankful, with a Spanish flair. Kinda. You’re welcome. It’s Saturday! And I am thrilled to say that I’m actually going to get my Ten Things of Thankful post up on SATURDAY this weekend! HA! Woooo! It is almost 10 am here and all is still silent, except for our little Lubie bird chirping and pecking away happily at his bell in his cage. Emma is off at her “other family’s” house, Jacob is snoozing it up and Clyn had to go in to work for a bit this morning. So, here I sit. In my jammies, sipping on my English Breakfast tea, which is now slightly cold because it is chilly here, y’all! Woke up to temps in the upper 30s, which is cold for the end of October in South Carolina! I am currently refusing to turn on the heat, because I am sure that next week, we will be back in the 80s or something like that. When I turn on the heat, that means it is winter and I’m not ready to let go of fall just yet. On that note, I will go nuke my tea…. …and we’re back! That is much better! I almost got completely sidetracked (shocker!) by a tempting email from Snapfish telling me I can order my Christmas cards NOW and get 50% off my order. I’m not going to lie, I went and looked and clicked around and almost got stuck there! Oh my, the ADD is kicking up for real today! On to the business at hand! This week…has been long. Not in a bad way, but somehow yesterday morning when I was driving to the gym, it occurred to me that Monday seemed like a long time ago. Partly, I think, it is due to the fact that my poor, sweet hubby has been working extremely long hours this week. A project of his this week has required him to be at work really early, 5 am early, and to stay really late. One night, I am pretty sure he got home around 11:30. And he is back there today, Saturday. He is my thankful thing numero uno. He works so hard and is so conscientious about his work. I hope those people know how blessed they are to have such an employee as my man! But if they don’t, I do. And I know that everything he does is for the kids and me. And, no, he does not get paid overtime, as he is a salaried employee. Thankful thing numero dos and tres. (Do y’all like my Español, by the way?? HA!) I am thankful for my hilarious daughter (thing dos…literally and figuratively). I’m telling you, she makes me laugh so hard sometimes that I snort and tears come out of my eyes. She is medicine to me. She is also an excellent student, who, along with tons of her peers, was honored for her academic achievements in a ceremony this week at school. She is so nonchalant about it all, which is funny to me. Girl! You got all As in every subject last year, for the whole school year! It is okay to be happy and proud of that! But no. It is just what she does. Nothing special. Whatevs. Again, hilarious. But we are proud…Look at her and Harper, aren’t they lovely? Yes, they are. And did you even know you could “letter” in academics?? I didn’t. 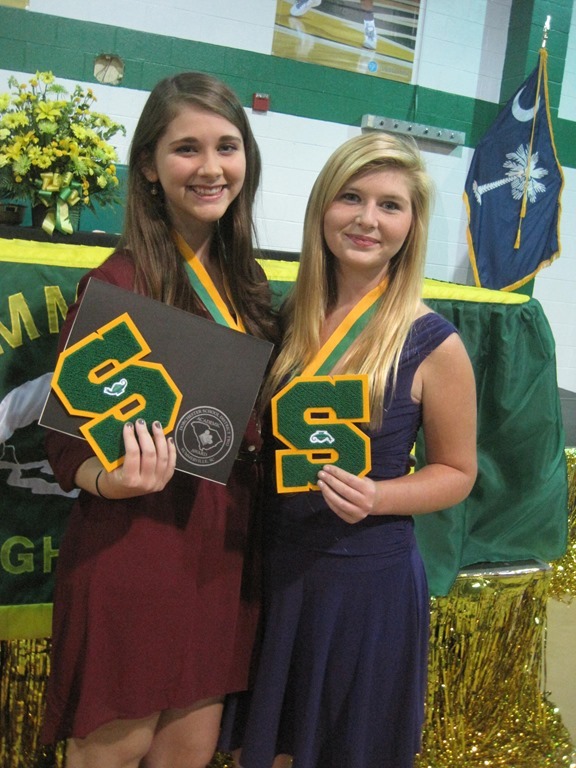 I only thought you lettered in athletics. Shows how much I know. After the ceremony, we enjoyed a fun dinner with Harper and her family (thing tres)—they are a fun and crazy family. Thankful thing numero quatro and cinco go together. (Okay, I’m just going with it now. I started a pattern and I can’t simply abandon that pattern. That would just be wrong!) So, I made a new friend this week (thing quatro), which I always love doing! She is a sweet, wonderful lady in my town, who emailed me this week, out of the blue. (Seemingly, but I do not believe in coincidence.) She was emailing me to invite me to participate in a day-long Christian women’s conference that is being held at her church in January (thing cinco). I was pretty freaked out. I’ve never stood up in front of a group of people to talk about anything. I’m not counting my students because that it not stuff I have to come up with out of my own head! And I’m not counting that speech class I had to take in college, because they actually give you a topic to talk about! This would be leading a small breakout session in a topic of my choosing as it relates to encouraging women. Really? It blows my mind that, first of all, any more than 5 people actually read my ramblings on a daily basis and, second of all, that I would have anything of value to share with a group of women. It is very humbling, but also a very exciting opportunity that I have agreed to take on. Sometimes we have to go do that thing which we are so afraid to do; otherwise, how do we stretch and grow? The people I love have all told me they believe in me and to go for it. And so, here I go. Pray for me, y’all! Thankful thing numero seis. This weather does make me happy. It makes me think of James Taylor’s song, Walking Man (see video below…I do LOVE ME some JT—not to be confused with Justin Timberlake. Sorry, Justin, James Taylor is the original JT. Just saying. The man’s voice is like butter!). “…The leaves have come to turning and the goose has gone to fly….The frost is on the pumpkin and the hay is in the barn…” These are the lyrics that come to mind when I see that early frost. I love getting the sweaters out to wear and walking out the door to that clean, crisp smell in the air. It also makes me think of the county fair and that makes me think of funnel cakes. Mmmm, I can smell them now! Our local fair starts next week! Funnel cake, here I come! Thankful thing numero siete. Jacob’s school had fall break this past week. So, it meant we were not traipsing back and forth. Our evenings were our own and he actually got ahead on his assignments. We crank back up in full force on Monday, though. But before we know it, the holidays will be upon us and he will have completed his first semester of college! My mind is blown. Thankful thing numero ocho. I managed to do some laundry this week. Not nearly enough, but, hey, at least my man had some clean underwear. Thankful thing numero nueve. I am so excited and, frankly, shocked, that I already have some Christmas gifts checked off my list! This is so crazy. I NEVER shop for Christmas before December. Never. In fact, I usually make it a rule, because I find it so irritating that Thanksgiving is pretty much ignored. Anyway, I ordered something for my mom that should be arriving at my door today! Can’t wait to see how it turned out. I can’t tell you what it is! She might be reading! But she is going to love it! (Read that in a sing-songy voice, okay?) I have already gotten gifts for both my brothers and their wives as well! As siblings, we do “couple gifts”, so I have something for them that I think is a big score! I love it when I actually get a good gift idea, that is personal, that I am sure the recipient will love! I usually struggle in the couple gift department, because the gift I end up getting is usually always more geared toward one half of the couple. And then it doesn’t really feel like a couple gift at all. This made me laugh. so. hard. And I do not lie when I say my face was hurting and I was crying with laughter. Poor Amy. I really hope Ellen pays her well. Pretty sure she is scared of her own shadow and that Andy, well, he is one angry scared person, right? The year Amy went through the haunted house with her mother was pretty hilarious as well. So so funny. Have a wonderful weekend—stay thankful and stay funny! I am late this week to the Ten Things of Thankful party. And last weekend, I missed the party altogether! I missed y’all! There have been ups and downs this week, and to be honest I am the person who really tries to see the silver linings and put on a happy face. But then busy-ness and sickness and crazy people enter the picture, and dang it!, that has a way of interfering with my happy face plan! So I am happy to share with you some of my happy face moments from this week! 1. I know I keep bragging about my boy child, but daggone it!, I think it is deserved! He has earned some more fine grades in his classes! I can tell he is proud of himself. And we are proud too. He really has gotten the hang of this college boy thing and it is awesome to see him taking responsibility and doing what needs to be done for his classes. 2. I am so thankful that my daughter has her best friend. She is blessed to have her friend Harper, who is a such a sweet and loyal young lady. A positive and encouraging friend. I call her my bonus child. They are good for each other and I know there are a lot of parents who worry about the friend choices that their children make. We are blessed. 3. I have been loving the online book discussion I have been participating in for the last few weeks with my bloggy friend, Sarah, who is also an “in real life” friend. The book is The Fire of Delayed Answers by Bob Sorge. The book is about how God uses that time in the trials of our lives—that time when He seems to be delaying His answers to us—to help refine us. It has been so good to me and I am getting so much out of it and also reading the responses of others has been such a blessing. I encourage you to check in here on Wednesdays to be a part. 4. I had a couple of days this week when I wasn’t feeling so hot—just the general allergy induced crud, I think—and one of those evenings, the Hubs called me before he left work and said he would stop on his way home and pick up dinner for us all. I really appreciated it and was glad not to cook. He is a sweet fella. 5. And even though I had those few days where I felt kinda icky, I still managed to get to the gym for my dance fitness class three times this week. Basically, right now, it is only keeping me from getting fatter, because I have to be honest and say that my eating habits have really stunk of late. Still, I enjoy the classes so much. It is a lot of fun. 6. I am also thankful for my tea. I used to really love my coffee…and don’t get me wrong…I still do, but for several months, I have been on a tea kick. I think it’s that whole Downton Abbey thing and the desire of my daughter and me to actually be British. I don’t know. But in the mornings, I put the kettle on and fix myself up a cup, sometimes a pot! Something about the whole process is just so comforting. 7. And on that note, let me just say that I love when Emma and I talk in British accents. I am sure they are horrid, but it is fun and we do crack ourselves up. We envision ourselves at Downton Abbey, as Violet, the Dowager Countess and Mrs. Patmore. I am definitely a downstairs kind of person—Mrs. Patmore is me. HA! Emma’s whole Brit obsession began with Harry Potter, I am pretty sure. We do love us some HP. And now we love Downton, so we continue to pretend to be Brits. Oh, we have been known to do it in public too. I am working on Emma, because I don’t think she could truly embrace the British culture until she totally embraces the whole tea thing. So I keep on trying to encourage her to love the hot tea. I know what you’re saying—Isn’t sweet tea a big thing where you live? Yes, as Southerners, we drink lots of tea, but it is mostly iced and really sweet. She struggles with the whole hot tea, with cream and sugar, thing. I’m not giving up! I know I am biased, but I think she is pretty darn talented. 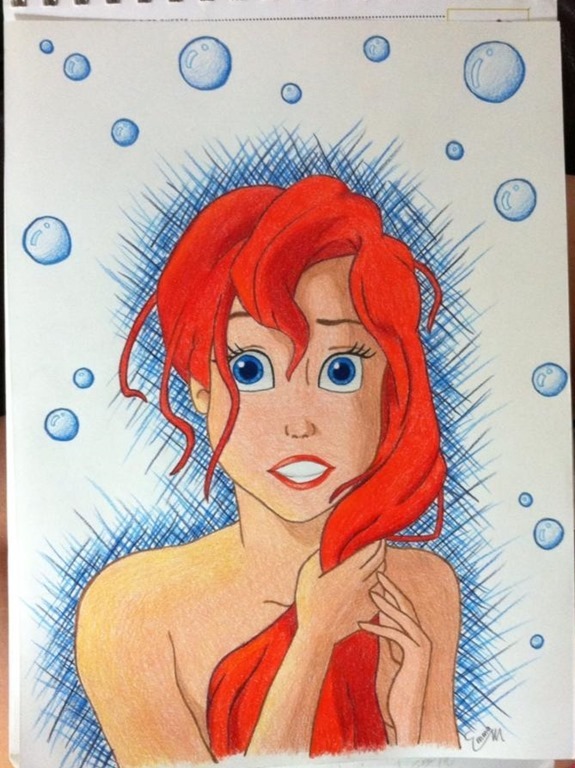 She drew this, just by looking at a picture. And this photo of her drawing doesn’t nearly do it justice. She blows me away. 9. I have pretty much turned off my TV during whole government shutdown ridiculousness that is happening in Washington right now. Especially during the day and during any time I knew there would be news casts on. And I avoid the all-news-all-the-time channels for the most part anyway. I have enjoyed not listening to all the bickering and the lack of thought about what really matters by our elected officials and all the analysis by the talking heads and all the blah blah blah. Haven’t missed it. Give me Duck Dynasty and Parenthood any day. And I’m Happy, Happy, Happy! 10. I was about to bag the TToT for this week, because I thought…oooh, it’s already later Sunday afternoon. I was thinking I would get to it, but now it’s just late. I’ll just forget about it. Then, I saw Lizzi’s shout out on The Twittah. And I said, awww, how sweet! I need to do it and Lizzi missed me! So, thanks! I am thankful for you and for caring enough to miss me! On Saturdays (usually—I realize today is Sunday! Ha!) I link up with the Ten Things of Thankful Blog Hop to celebrate all the things I am feeling especially thankful for this week. You can join in the gratitude at Lizzi’s blog—Considerings.